Walk Unafraid is a powerful public art installation that Gabrielle Senza first exhibited in 2003. We offer a collaborative public art program for schools, community groups and social service agencies around the country, working together to raise awareness and empower victims of abuse. Having developed a reputation as a creative activist for social and environmental causes, Gabrielle was invited to participate in an exhibition titled Art as Activism as Art in New Marlborough, MA. On that occasion, Gabrielle solicited via e-mail: 1) silencing threats that victims of abuse might hear, and 2) empowering mantras that might enable victims to seek safety and that would help raise public awareness of the devastating effects of physical, sexual or emotional abuse. The responses she received were very, very real. Many friends who responded and many participants she didn’t know, had, like her, experienced some form of abuse in their lives. From that collaboration came Walk Unafraid, a mock crime scene representing the often, fatal effects of abuse. 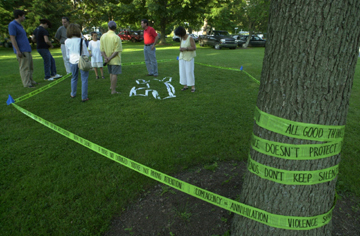 Shredded bits of shirt fabric (containing the threatening phrases hand scrawled on the fabric) formed the imaginary victim’s body outline, and police barricade tape with empowering slogans block-lettered on the blank side, facing out toward the viewers marked off the “crime scene”. Since then Gabrielle Senza have produced Walk Unafraid installations in several public locations in the United States. In mounting these installations, she has had the privilege of working with dozens of wonderful collaborators, many of whom are survivors of abuse. These include: Gabrielle’s art students & studio interns (both male and female), close friends, mothers and children from shelters, homeless teens, directors and volunteers from other social-change organizations, and people passing by in the streets while the work is in progress. The experience has been emotionally intense and empowering for all who have participated in creating these installations. The social service agencies with whom Gabrielle collaborated, together with the institutions and municipalities who have hosted the installations all recognize and support the power of giving voice to the voiceless,empowering survivors, raising public awareness, and working towards education, prevention and assistance to victims. They acknowledge the important part a public art project like Walk Unafraid has in accomplishing those goals. To learn more about bringing a Walk Unafraid project to your organization, school or neighborhood, please contact us.